I ran a half marathon yesterday. It was just the fourth half marathon I have ever run. It has been two years since my last race, and I'm in worse shape then I was at that time. Regardless, I finished and with a respectable time. It wasn't the fastest I have run a half marathon, but not bad. It was actually only 11 minutes slower than my fastest time. I am a slow runner even when I am better prepared. I have started toying with the idea of running a full marathon. I never though I would run a full marathon, but I need to do it sooner than later if I ever intend to do it. I'm not getting any younger. Yesterday on the metro on the way to the race, I spoke to a more serious runner. She has run a few full marathons. She told me about a training program created by Hal Higdon. I am feeling incredibly optimistic about doing a full marathon next year at this time. It was a little chilly yesterday. I prefer running when it is a little cool, but it was rough waiting for the race to start for about 40 minutes without my coat. I checked my coat in the bag check, and then preceded to shiver until the race actually began. 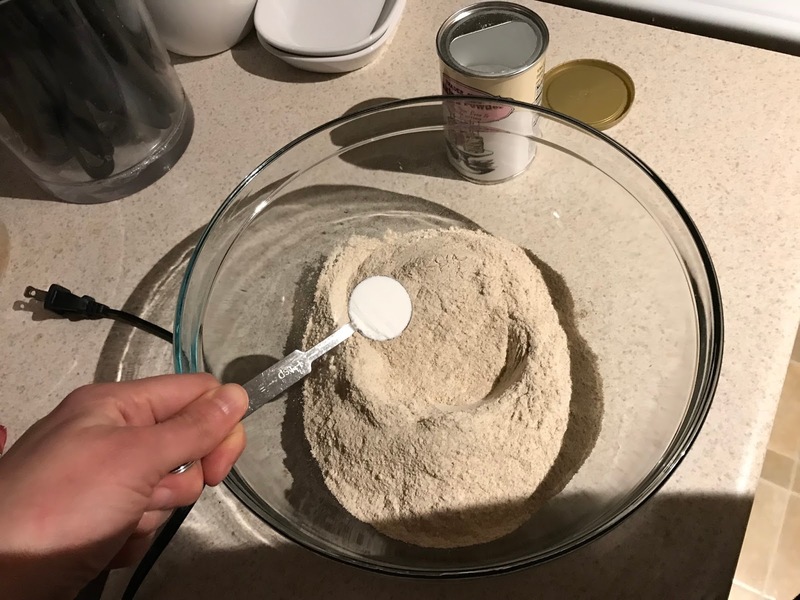 I found this whole wheat pancake recipe on Genius Kitchen. 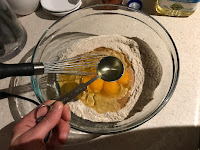 This is the first whole wheat pancake recipe I have ever posted on my blog. I doubled the recipe, and added coco nibs, chocolate chips, toffee bits, and walnuts. I also swapped out regular milk for the buttermilk. 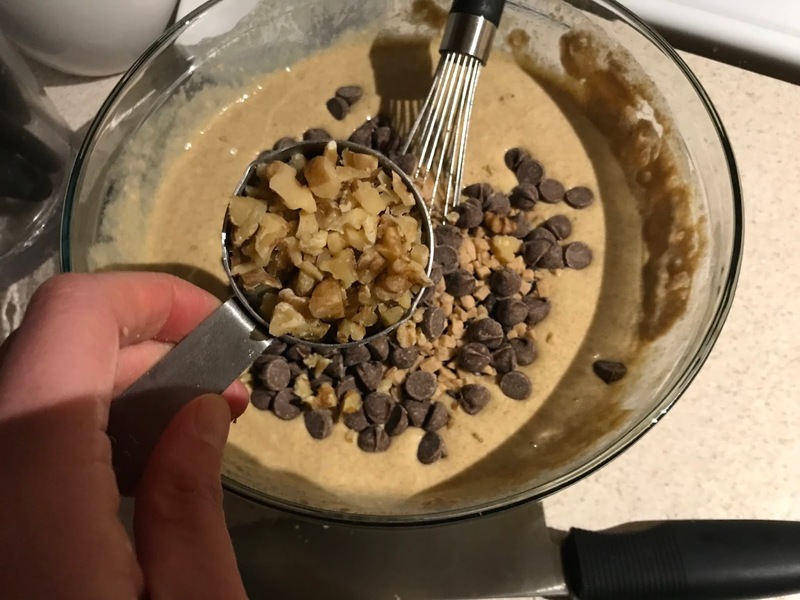 The ingredients are 2 cups whole wheat flour, 4 teaspoons baking powder, 1 teaspoon salt, 2 tablespoons honey, 6 tablespoons oil, 2 cups milk, 4 large eggs, 1/4 cup coco nibs, 1/2 cup chocolate chips, 1/2 cup toffee bits, and 1/4 cup walnuts. 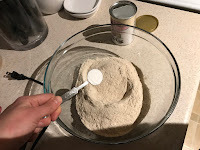 I added the whole wheat flour, baking soda, and salt into a bowl. 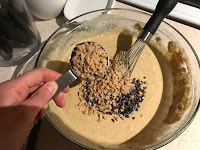 I whisked the dry ingredients together. 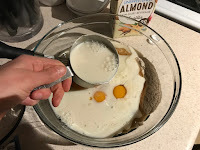 I made a whole in the dry ingredients, and I added the eggs, oil, honey, and milk into the whole. 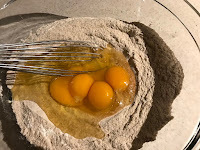 I broke the eggs and mixed the wet ingredients together before stirring the batter together completely. I added the coco nibs, toffee, chocolate chips, and chopped walnuts. I stirred the batter together. 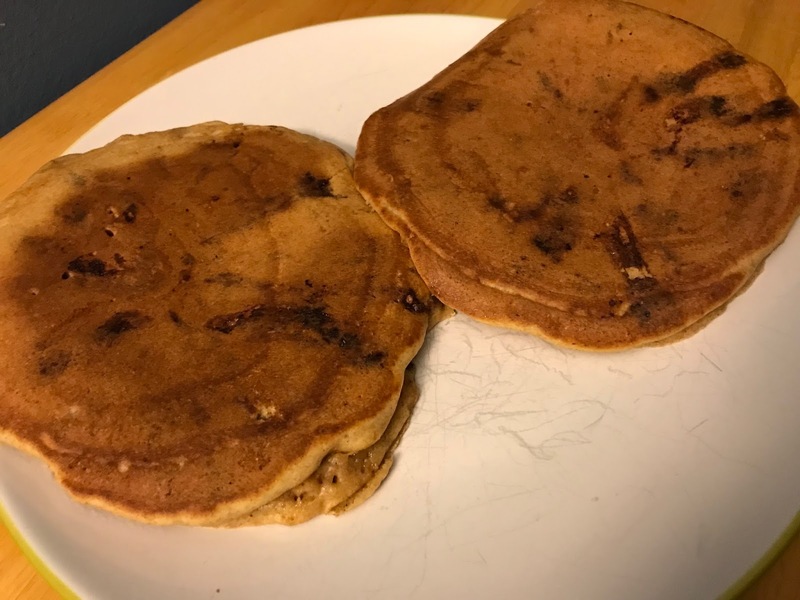 I cooked these pancakes in a greased and hot skillet over medium heat. I used about a third of a cup of batter for each pancake. I flipped the pancakes and cooked the other side once bubbles started forming in the center of the pancake. I cooked the reverse side for a few minutes. Both sides should be a light, golden brown color. I served these with greek yogurt on top, as is my custom. 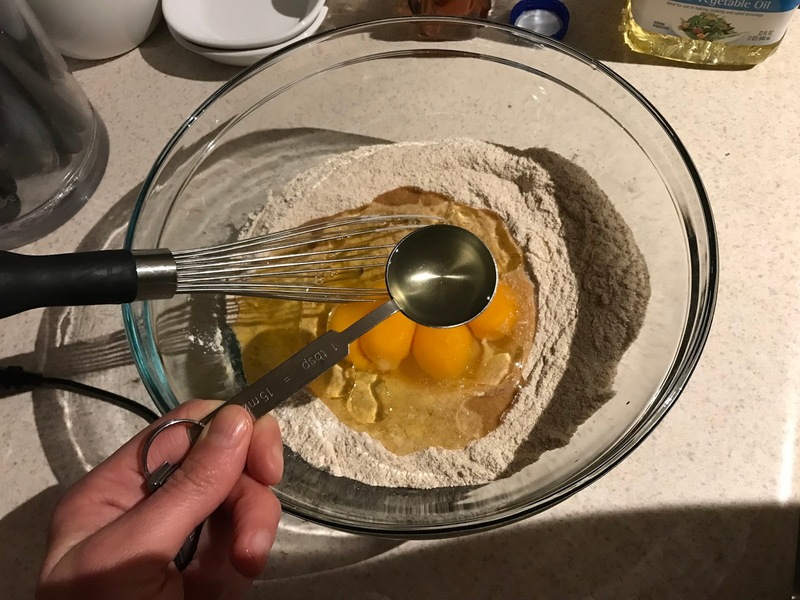 This is a delicious pancake recipe. The texture if thick, and hearty. 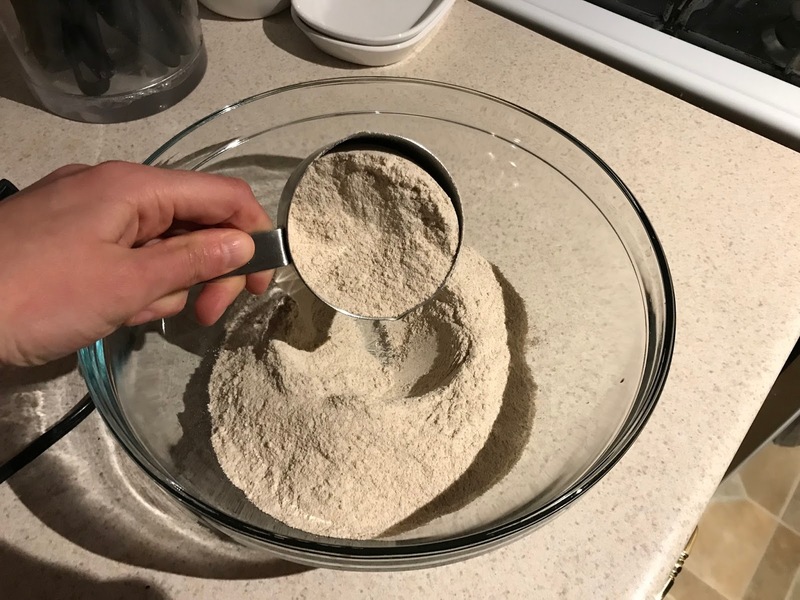 It isn't dense though. It is still very fluffy. It has a welcome nutty flavor from the whole wheat flour. 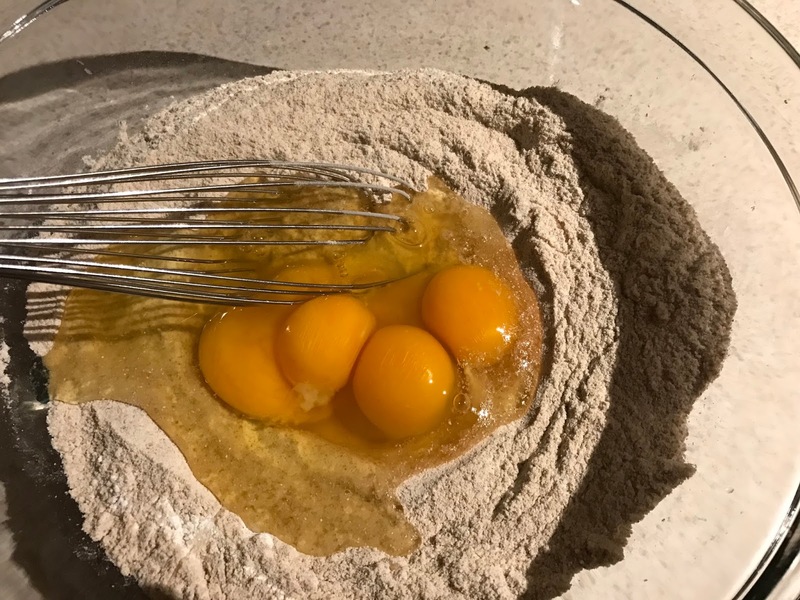 The batter itself is not super sweet. It just had a touch of sweetness from the honey. The chocolate chips and toffee bits make these a decadent breakfast. The chocolate was creamy and gooey. The toffee was buttery and crisp. The toffee added a caramelized flavor. 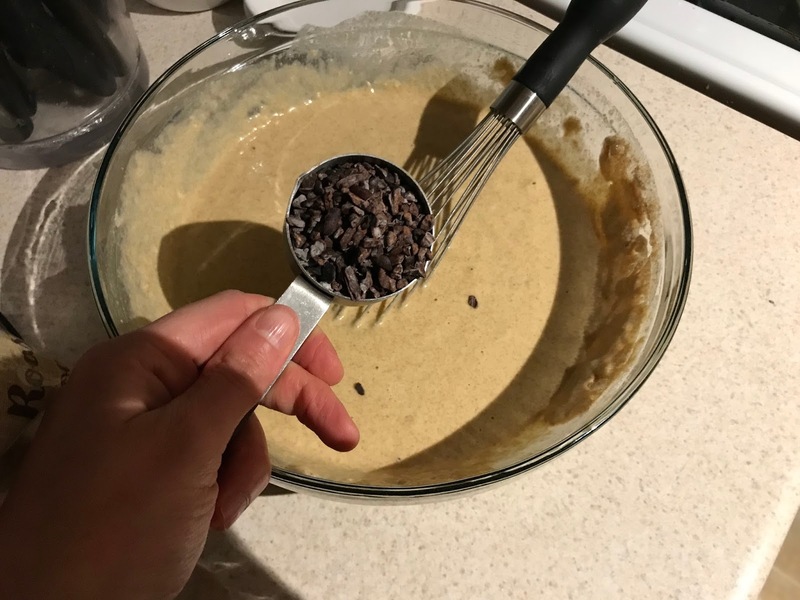 The coco nibs added additional cocoa flavor. It is a dark and bitter flavor. It added richness and depth. They were a little crunchy too. They were a welcome addition. The walnuts were nutty and crunchy. Overall, these were scrumptious pancakes. They were filling and tasty. 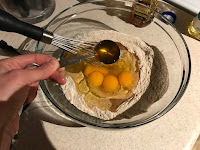 I will make whole wheat pancakes again in the near future.